Our next stop in England was going to visit my brother’s in-laws’ new house in the Cotswolds in Gloucestershire. After a ~2 hour train ride across England, the train enters into a tunnel and emerges into the rolling hills of Gloucestershire. 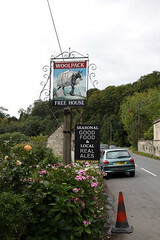 After being picked up in Stroud by my brother’s father-in-law (Paul, who I will refer to now by name to avoid saying that phrase over and over) and settling into their house in Sheepscombe, they invited us out for a pleasant walk in the country as we made our way to one of the local pubs, the Woolpack, down the road in Slad. Slad is famous for being the home of author Laurie Lee, who based his book Cider with Rosie on his own life in the village, and supposedly had many adventures at this very pub. It’s a rather nice little pub, perched on the side of a small valley with a stream at the bottom, where you can sit in the dining room and look out over the countryside. 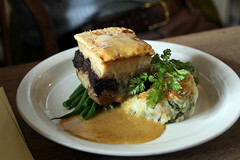 It also has very good food, ranging from classic pub fare to some fairly inventive main dishes. 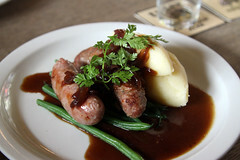 I opted for the former, selecting the Stroud and Gloucester Sausages and Mash. Stroud in particular is known for having good English sausages, and my dish was no exception. Two very nice sausages, both nicely seared, with a good bed of mash and some very flavorful and not-too-salty gravy. The had nicely contrasting flavors, with one of the sausages primarily focusing on pork flavors, and the other having your more typical “banger” consistency with some rusk mixed in with the meat. Carol was more adventuresome, and was handsomely awarded for it, since she ordered the Stuffed Pork Belly: a crisped pork belly, stuffed with black pudding, served on a bubble-and-squeak cake, served with a honey veloute. All in all, a very pleasant little country pub, one that I’m glad is a nice country walk away from Paul’s place. I certainly look forward to future visits.